In a bonus podcast to mark the 100th episode of The Infinite Monkey Cage, Robin Ince invites Brian Cox to embark on a trip down memory lane. Brian points out that the notion of memory lane makes no sense because it “violates really fundamental physical principles”. Brian and Robin both rhapsodise over ex-astronaut Charlie Duke’s first-hand account of the Apollo 16 moon mission. As Charlie and his crew bounced around on the lunar surface, the 1972 Olympic Games were taking place 238,855 miles away in Munich. To mark the occasion, the astronauts organised their own Moon Olympics. Charlie describes how he attempted an ambitious high jump, but lost control of his trajectory mid-flight and began tipping backwards. He tumbled towards the lunar surface, the fragile life support system on his back heading straight for the craggy rocks beneath. This episode sticks out for Brian and Robin because of the dramatic noises produced by the audience. When Prof Monica Grady presents to the panel two meteorites – one dating back to the birth of our solar system, the other “blasted from the surface of Mars a few million years ago” – the audience gasps in awe and wonder. Not to be outdone, Patrick Stewart – Captain Jean Luc Picard from Star Trek: The Next Generation – shows off the communicator he wore on the breast of his Star Fleet uniform. A collective sigh ripples through the high number of Trekkies gathered in the studio. Robin recalls with faux disgust that even Brian uttered a little moan, instantly forgetting the piece of Mars he had been holding in his hand moments earlier! 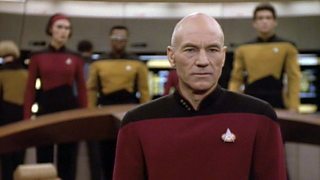 Patrick Stewart shares some Star Trek secrets. 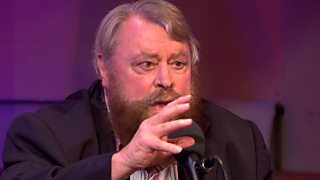 Robin and Brian note that the ever popular guest Brian Blessed is an editor’s nightmare due to the profusion of profanity that peppers his every pronouncement. But in tribute to his recently departed friend Patrick Moore – the erstwhile presenter of The Sky at Night – Blessed dials down the blustery bombast long enough to deliver a heartfelt rendition of the poem Lollington Downs by John Masefield. Amid the hot science and unabashed comic nerdery, it’s a real lump-in-the-throat moment. In the Oceans episode from series 16, Brian and Robin ask ocean explorer Jon Copley and marine biologist Helen Scales to pick their favourite aquatic creatures. Brian Blessed recites the poem Lollington Downs. Jon chooses the Benthic Siphonophore – a shaggy, tentacular “spaghetti monster” – while Helen plumps for a unique shell-dwelling cephalopod called the Argonaut that sails the open seas like an “octopus pirate”. Listen to Oceans: What Remains to Be Discovered? As part of their US tour, Brian and Robin were performing in the Ricardo Montalbán Theatre in LA – a venue named after the cult actor who was unforgettable as Star Trek’s charismatically-coiffed space villain Khan. As they were about to take to the stage, the voice of the great man himself was broadcast into the auditorium, politely requesting that audience members turn off their mobile phones. 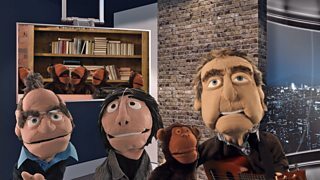 Then, to open the show, the Infinite Monkey Cage theme song was performed live by Eric Idle and Jeff Lynne. Both Brian and Robin agree this was an exceptionally hard act to follow! This episode explores the ongoing search for extra-terrestrial life in our solar system. Eric Idle performs the show's theme song. Prof Monica Grady thinks we should probe the vast caves of Mars, while Dr Carolyn Porco makes the case for sampling the organic compounds being vented into space from the subsurface polar ocean of Enceladus – Saturn’s sixth-largest moon. Throughout the recording of the 2015 Christmas Day special, Robin was suffering with a devilish bout of diarrhoea. He recalls how, despite dosing up on Imodium, he was unable to make it through the full show. Robin admits to having slipped backstage to relieve himself while Fay Dowker responded in particular detail to an earlier question. He blames his sudden exit on a cruel psychosomatic experiment performed by Brian that involved suggestively teasing a cork from a sherry bottle throughout the recording.